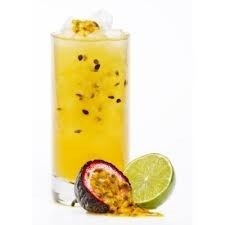 Imagine a Tequila Sunrise without Tequila and created with Passionfruit - absolute heaven. Passionate Sunrise is a beautiful, sweet but not overly sweet medley of great flavours and tastes. The visual aspect of this Mocktail never fails to impress both young and old. Add all ingredients into a chilled Tall Cooler Glass. Add ice. Stir.